The Flaming Lips are an American rock band formed in Oklahoma City, Oklahoma in 1983. Instrumentally, their sound contains lush, multi-layered, psychedelic rock arrangements, but lyrically their compositions show elements of space rock, including unusual song and album titles�such as "What Is the Light? (An Untested Hypothesis Suggesting That the Chemical [In Our Brains] by Which We Are Able to Experience the Sensation of Being in Love Is the Same Chemical That Caused the "Big Bang" That Was the Birth of the Accelerating Universe)". 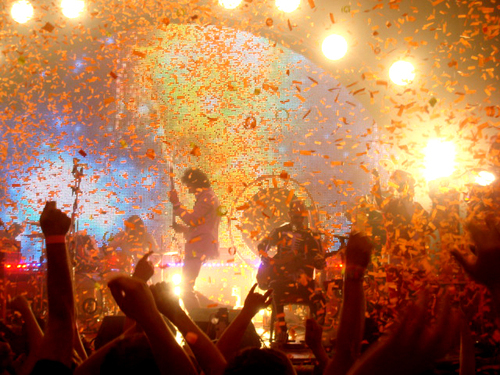 They are also acclaimed for their elaborate live shows, which feature costumes, balloons, puppets, video projections, complex stage light configurations, giant hands, large amounts of confetti, and frontman Wayne Coyne's signature man-sized plastic bubble, in which he traverses the audience. In 2002, Q magazinenamed The Flaming Lips one of the "50 Bands to See Before You Die." The group recorded several albums and EPs on an indie label, Restless, in the 1980s and early 1990s. After signing to Warner Brothers, they scored a hit in 1993 with "She Don't Use Jelly". Although it has been their only hit single in the U.S., the band has maintained critical respect and, to a lesser extent, commercial viability through albums such as 1999's The Soft Bulletin (which was NME magazine's Album of the Year) and 2002'sYoshimi Battles the Pink Robots. They have had more hit singles in the UK and Europe than in the U.S. In February 2007, they were nominated for a 2007 BRIT Award in the "Best International Act" category. By 2007, the group garnered three Grammy Awards, including two for Best Rock Instrumental Performance.